Sperber's trompe l'oeil works featuring digital technology and comonplace objects continue a series of exhibitions at the Kohler exploring utility in contemporary art. 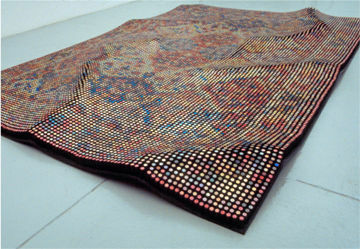 Using a computer to pixelate pictures, Sperber recomposes the images manually with small manufactured objects: 165,000 pipe cleaners coalesce into a shag rug. 20,000 spolls of variously colered thread compose a large-scale "painting." This technique not only reflects our current digital age, it also recalls Pointillist theaories of optics. Some of the works play the illusion/reality game with the aid of rearview mirrors and other devices: framied in the lens, industrial spolls of thread transform into a craggy rock wall.